Summer programing has begun but it’s not too late to register or just drop in to see a class in action. ASTROCAMP is every Thursday, now through August 16th. Morning sessions (9:30-12:00) or afternoon sessions (12:30-3:00) are $15 each, or stay the full day for $25, lunch included! Pre-arranged late pickup is also available. Check the website for a complete listing for the summer. Summer LEGO ROBOTICS sessions are available on Tuesday mornings (10:00-12:00) July 24, 31, and August 7, 14, 21, 28; $10 per session or $30 for any 4 sessions. Thursday afternoon (12:30-2:30) sessions are also available, July 19, 26, August 2, 9, 16; $10 per session. Keep an eye out for announcements concerning our upcoming SPACE DAYS in August! We continue to run space missions for students and community groups from WNY. If you know of anyone who would like more information on our school or community group programs, please ask them to contact us. Groups of at least 8 or up to 30, that would be interested in running a mission, can contact the center at (716) 434-3196. August will kick-off of the new First Lego League (FLL) tournament season. The focus topic is Into Orbit. The team is open to new members, age 9 and up, for the up-coming competition season. Participants do not need to be students at Lockport schools to join. The team will meet during Tuesday morning robotics sessions through August, then during the Tuesday after school robotics program thereafter. 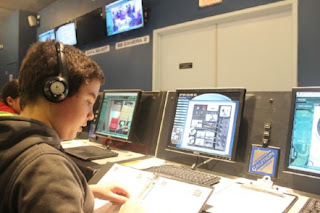 The Challenger Learning Center of Lockport is is a community-based, learning-oriented organization ​geared towards enriching the minds of our youth and adults alike.